“I don’t use LED bulbs,” my friend was saying, “The light is terrible. Why would I spend time and money on paint and furnishings just to ruin everything with crappy light?” I was showing her my new living room, and was about to switch on the lights, some of which were LEDs. I had to admit she had a point. While choosing paint colours, I had spent dozens of hours trying the different paint swatches under different kinds of light. Good painting and decorating guidebooks all suggest that you view swatches not only under daylight, but under the artificial light for the room as well. My problem was that I was trying to choose my light sources at the same time! I had rigged up clamp lamps with a fluorescent bulb, a “warm” LED, and a halogen bulb. As much as I wanted to be eco-friendly and like the LED, I consistently preferred the halogen. It just made everything look like an art gallery. I felt like absolute trash! But what is it about different kinds of light that makes us like or dislike it? For design purposes, light can be evaluated in two different ways. 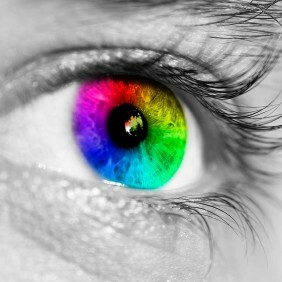 As you know, the visible light spectrum contains red, orange, yellow, green, blue, indigo, and violet. Some artificial light sources illuminate objects better in some parts of the spectrum than others. The higher the light source’s CRI, the more of the spectrum it will illuminate. For example daylight, incandescent and halogen bulbs all illuminate the entire spectrum, and have a CRI of 100. Low-pressure sodium lights (found in many street lamps) illuminate with only yellow light. But just because a light has the maximum CRI of 100, that doesn’t mean you’ll have the true colours of what you’re looking at. Colour temperature refers to its colour balance in terms of more blues and greens versus more reds and yellows. If you’ve ever taken pictures indoors and outside, you’ll know that some light sources are warm and others are cooler. Daylight has a bluer quality, and incandescent lights glow with a cozy yellow light. You need to change the colour balance on your camera to compensate. When we look at the objects in out homes under low-CRI light (like a fluorescent), we notice that they look flat and lifeless. A colour temperature that is too cool (like cool LEDs) may seem uninviting. In the drive to save energy, some of the newer lighting types save on power consumption but have sacrificed some parts of the spectrum (e.g. fluorescent lights) or don’t have the warm colour temperature people want in their homes at night (both fluorescents and LEDs have been guilty of this). Spectral response in different kinds of light sources including daylight, incandescent bulbs, LED bulbs, and fluorescent bulbs. 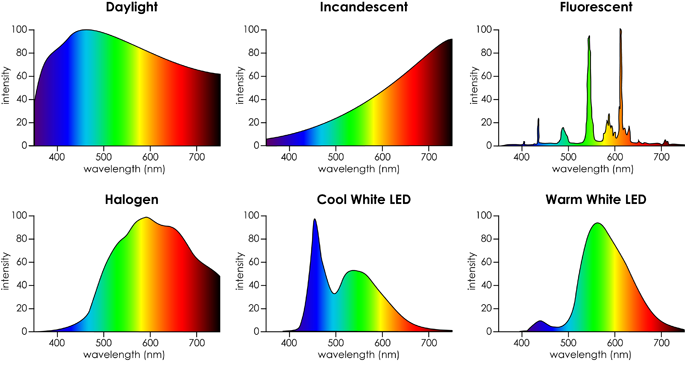 You can see how different even full-spectrum light sources like daylight, halogen and incandescent light can be in terms of how much of each colour you get: daylight gives more intense but cooler light. 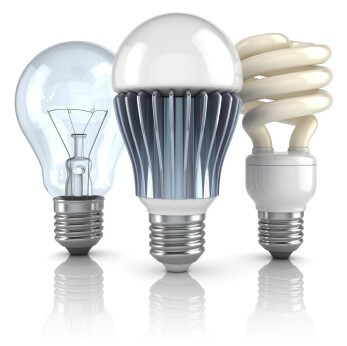 With new technologies come improvements, however, the LED bulbs that have been coming out in the past few years have shown incredible improvements. In the video below you can see Inhabitat’s Jill Fehrenbacher proves to several designers that some of the newer varieties can be very impressive. The good news is that many LED and other lighting manufactures post the spectral response diagrams for their products on their websites. If you know what effect you’re looking for, you can check them out before spending any money (as we all know, LEDs are not cheap). How did I solve my dilemma? In the end, I decided on a compromise: halogens in the pot lights (because they would be seen directly), and LEDs in the shaded fixtures that would give the light quality a boost of warmth. I felt that the halogens would be Ok because we have them on dimmers, and almost never use them at full strength, so they’re using less energy. Coincidentally, I had discovered the bulbs demonstrated in the video above, and I agree that they look much better than any of the other LEDs I have tried. So what happened when I switched on the lights? My friend loved the light quality, and didn’t even notice that the lights in the fixtures were LEDs – I had to tell her they were there. Score one for eco-friendly design!